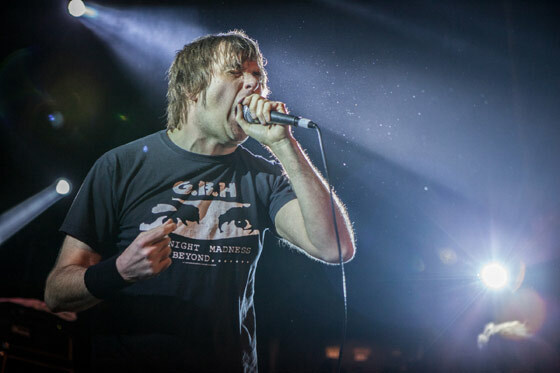 Napalm Death vocalist Barney Greenway has reached out to Indonesian president Joko Widodo in an effort to overturn a few upcoming death sentences in the country. With the president apparently being a big Napalm Death fan, having been seen in photos wearing one of their T-shirts, UK grind vocalist Greenway has penned a pair of letters asking clemency in the matter of a pair of drug-related cases. Earlier in the month, it was reported by Metal Injection that the musician had asked Widodo to call off the execution of Australian metal fans Andrew Chan and Myuran Sukumaran, two Australian metal fans who are currently incarcerated for smuggling heroin into the country. Greenway urged for a non-violent solution, which he told Widodo is a theme often covered in Napalm Death's music. "As a follower of our band Napalm Death, you would appreciate that our lyrics and ethos challenge the unbroken cycle of violence in the world, whether it comes from a state or as an individual," he wrote in the letter. "If these things are not challenged and ultimately changed, I believe we will never truly move forward as humankind." The Independent now reports that a second letter has been sent, with Greenway now asking to spare the life of Lindsay Sandiford, a British woman arrested in Bali after being caught coming into the country £1.6 million of cocaine. Sandiford claims that drug dealers had forced to carry the drugs over into Indonesia from Thailand and had the lives of her children threatened if she did cooperate. "My request for a considered, humane perspective extends to all prison detainees, but particularly in the case of Lindsay Sandiford it would appear that she was under duress to transport drugs, with her family under threat if she did not comply," he wrote in the second letter. Greenway goes on to note that Sandiford currently has no legal representation, and worries about a "miscarriage of justice." Again, he pleads for clemency, appealing to Widodo's more progressive politicking. "To my mind, your election platform promises of moves toward a more egalitarian civic structure means protection at all levels — and capital punishment can only take things backwards in that respect." You can read the full letter below. Widodo has not yet responded. In band news, Napalm Death are currently on tour behind the recently released Apex Predator - Easy Meat. You'll find the details on their "Through Space and Grind" tour with Voivod and Exhumed over here. I ask you to please keep these promises at the forefront of your mind and urgently give your attention to Lindsay Sandiford's plight.